The CTA's Ashland Bus Rapid Transit proposal would cut Ashland Avenue traffic lanes from four to two, to dedicate the interior two lanes to express buses. The plan keeps two parking lanes, and eliminate left turns from Ashland except at highway access points. Details are at transitchicago.com/ashlandbrt. Decreasing travel time (decrease of about 8 minutes from 35th to Irving Park) and increasing reliability for the large number of public transit users on Ashland. Supporting businesses along Ashland Avenue. Connecting rail and other bus lines. EVA has not taken a position to date, although it has provided information regarding process in prior meetings. EVA has heard presentations from the CTA, the Active Transportation Alliance and the Ashland-Western Coalition. Nearby neighborhood groups have taken positions. The Environmental Assessment for the Ashland BRT was released on Nov. 19, 2013, and the public comment period ended Dec. 20, 2013. 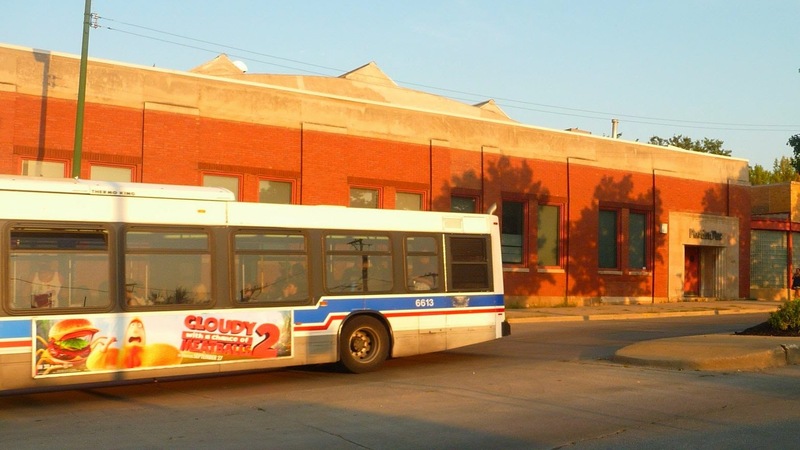 Two public meetings were held by CTA during the public comment period. The question before the membership is: Does EVA oppose the Ashland BRT as it is currently proposed by the CTA? The board expects to revisit this issue if the CTA alters the Ashland BRT proposal in the future. Ashland BRT is a substantial improvement for pedestrians who use Ashland. BRTs are working in cities like Johannesburg where the public was initially skeptical. It may increase property values. Homes near el stops are desirable, and some people are buying in East Village because of its proximity to the Ashland BRT. Traffic controls can be implemented on side streets, and drivers will adjust. Ashland will look better and be more pedestrian friendly. Ashland BRT will boost Ashland Avenue's economy. Ashland BRT will be implemented sooner than an Ashland subway ever will be. The first Ashland subway proposal was in 1958. Cars are already subsidized by government road support. This will support an alternative. Traffic analysis in the environmental assessment extends only a half-block from Ashland, but effects of the Ashland BRT will be felt further and on many residential side streets. Ashland BRT has high cost ($161 million) for minimal benefits. Return of the Ashland express bus would largely address the problems the environmental assessment has identified. Direct comparison between the Ashland BRT and BRTs implemented in other cities cannot be made. Increased traffic on residential side streets will bring excess noise and vibration to homes. Realtors are hearing from clients who do not want to invest in East Village if the Ashland BRT is implemented. Ashland BRT will cause problems with truck deliveries on Ashland. Traffic controls will be problematic on residential side streets (speed bumps, roundabouts, converting 1-way streets to 2-way streets). LaSalle II elementary school parents, children and staff have problems with the current level of truck traffic on Honore & Wolcott. This will add more trucks there. Adding even one semitruck per day to a residential side street will dramatically affect quality of life. Discussion included the need for EVA to take a position at this time, the need for an Ashland subway and its high construction cost, the good of the entire city and not just East Village, regional as opposed to city traffic, and whether the real goal of the Ashland BRT is transferring federal dollars to Chicago. After some confusion regarding eligibility, a vote was taken. (EVA bylaws provide that members who are over 16, reside or own property within the EVA boundaries, and who have been members for at least three months can vote.) By a vote of 10 opposed to current BRT to 9 not opposed to BRT, EVA voted to oppose the Ashland BRT as currently proposed by the CTA. EVA will be requesting that organizations holding street fests within EVA boundaries be detailed, consistent and transparent in reporting their income and expenditures, to help ensure that required contributions to community nonprofits by the fests are actually made. Commercial Park is holding its annual Earth Day cleanup event on Saturday, April 26 as part of a citywide cleanup effort. Cleanup starts at 9am at 1845 W. Rice St. Lunch plus kids activities will start at noon. Members are encouraged to pick up trash on the street on other days too. Next CAPS meeting for Beat 1213 (east of Wood) is May 21. Next CAPS meeting for Beat 1212 (west of Wood) is June 3. Commercial Park Expansion/ Fifield Chicago Avenue Development: discussion is expected at 4/14 Board meeting & 5/3 General Membership meeting. Forbidden Root: The brewery will provide an update to the board April 14. Trader Joe’s: EVA is requesting that TJs present a traffic analysis to the group. Demolition: EVA is working on finding potential solutions or creative alternatives to the rapid loss through demolition of historically significant East Village buildings. Not all are located in the Commission on Chicago Landmarks' designated East Village Landmark District. EVA is not seeking to enlarge the current East Village district. EVA has begun working with Preservation Chicago and Landmarks Illinois to consider economic and construction factors that can result in demolition. Concepts being explored include raising the demolition permit fee for older and potentially significant buildings that are not part of a historic district but are significant along their street and in the community. Among alternatives are extending the time for public comment prior to issuance of demolition permit for these buildings, and providing certain zoning or building advantages to developers encouraging rehabilitation of these buildings. More updates will be provided as the process moves forward. Some changes have been made to the website; other changes will be tested and implemented. Please join. See the EVA website for details. Meeting began 7:08pm, adjourned 9:35pm.